SCHOTT PYRAN® Platinum F is a fire-protection-rated and impact-safety-rated glazing material made from a transparent glass-ceramic with thickness of 3/16”. 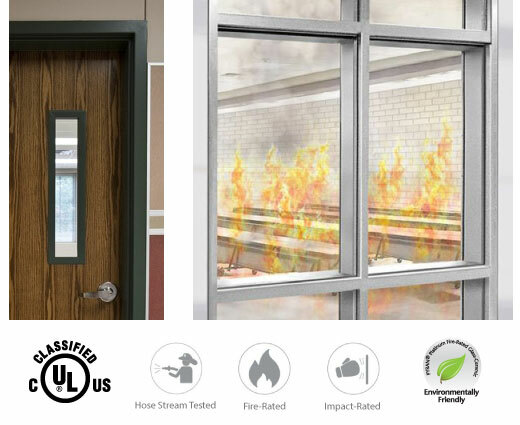 It has a surface applied safety film and is intended for use in safety-rated locations such as door vision lites, transoms or sidelites, and windows with fire-rating requirements up to 90 minutes and up to 180 minutes in doors. UL 9, UL 10B, UL 10C, NFPA 80, NFPA 252, NFPA 257, ASTM E2074, ASTM E2010-01, CPSC ANSI Z97.1, ULC CAN4-S104, ULC CAN4-S106. Labeling: After cutting, each lite of PYRAN® Platinum fire-rated glass-ceramic shall be permanently labeled according to local building code requirements with product and manufacturer’s name, UL certification mark, fire rating, etc. 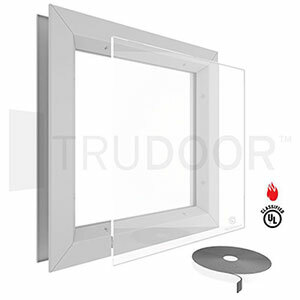 Trudoor is certified by UL to cut, re-certify and label fire-rated glazing materials. Our facility undergoes routine inspections to verify that modifications are done in compliance with the requirements of the UL specification listings. All material is tested in accordance with NFPA codes and standards. PYRAN® Platinum F is available in a complete vision lite kit (Frame, Glass & Glazing Tape). We stock a HUGE inventory of vision lite frames in gray or bronze finish – for use with 1-3/4″ thick fire-rated metal or wood doors. Common Sizes with a 3 Hour Fire-Rating include: 12″ x 12″, 5″ x 35″, 6″ x 27″, 7″ x 22″ and 8″ x 18″ (all 100 square inches of visible glass) – other common 20 to 90 Minute Rated sizes include: 8″ x 32″ and 24″ x 30″. Custom sizes available. All lite kits are professionally packaged to ensure safe delivery throughout the USA! We think PYRAN® Platinum is simply the best fire-protective glass available. It is made on a next generation float production line that makes a very high quality premium glass-ceramic in the industry’s largest sizes. Many people think it looks better than traditional rolled products that may require corrective grinding and polishing. 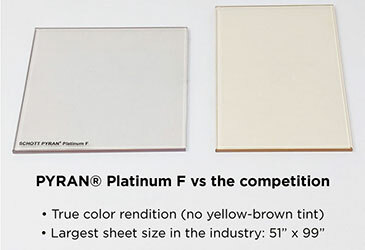 PYRAN® Platinum meets all of the required building codes for use in high traffic areas such as schools, hospitals, institutions, offices and other commercial buildings – without the amber tint! The choice is CLEAR – In terms of optical quality, color and price, you can’t beat PYRAN® Platinum from Trudoor. ®PYRAN is a registered trademark of SCHOTT AG.